At the GSPCA we are looking for volunteers to help with Flag Day event this Saturday at two Marks & Spencers stores. If you are able to help us out we would really appreciate it, please could you contact Sarah Ozanne at the Shelter with the time slots and places you can help with. At the GSPCA we are looking for volunteers to help with Flag Day event on Saturday 24th October at two Marks & Spencers stores. With only 2 days until the GSPCA Flag Day event on Saturday 23rd August we are looking for help. We would love to hear from you or your business if you are able to help us out this Saturday or at any of the events we are at. If you can help at one of the slots below or even pop a bucket on your counter at work then please could you contact Sarah Ozanne at the Shelter on 257261 with the time slot and location or if you would like us to drop a bucket or collection tin to your place of work we would love to hear from you. With only days until the GSPCA Flag Day event on Saturday 23rd August we are looking for help. 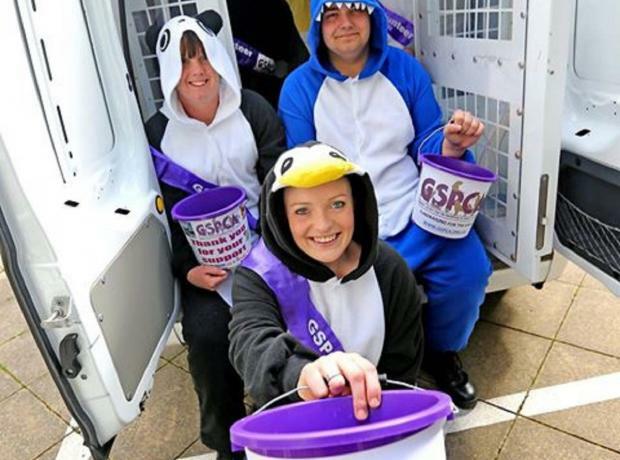 Its getting closer and closer to the GSPCA Flag Day event on Saturday 23rd August 2014. We are looking for help and if you are able to help us out, please could you contact Sarah Ozanne at the Shelter with the time slots and places you can help with.